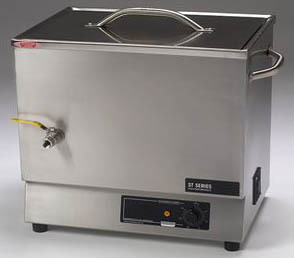 Unisonics industrial/commercial ultrasonic cleaners, the ST Series, is a high performance ultrasonic cleaning system. 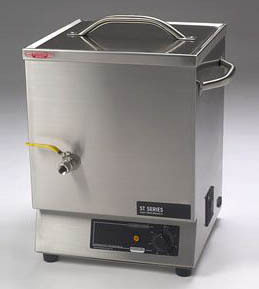 The single chamber device is used to clean surgical instruments and other hardware with sonic energy in a water detergent solution. The process generates a randomised sweep frequency through the ultrasonic bandwidth, which provides the most uniform fields of cavitation available in a 40KHz-process tank. 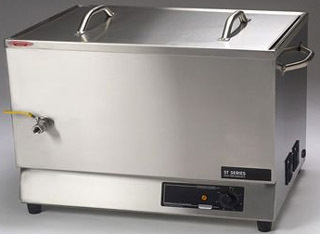 The unit has been designed for use in surgery reprocessing areas, central processing departments and laboratories. 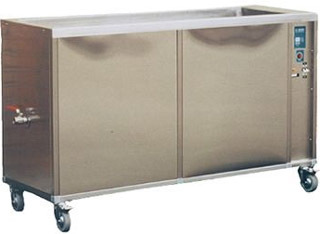 Most industrial cleaners are custom made, however, the following standard units are available. To contact for further information - ask. Like the above cleaners, these are frequently built to specifications. These tanks are on castors and dedicated to commercial tasks. 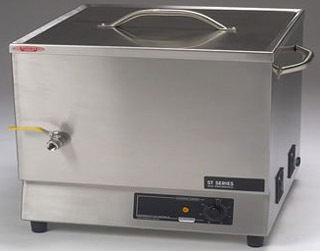 Sonifiers are able to process static samples from 1mL to greater than 500mL or flowing material up to 40L/h. Analog units are available in two power levels. 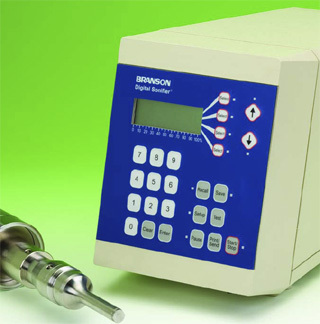 Digitally-operated units are offered in three power levels and are suggested for applications requiring higher levels of process control or parameter measurement. Sonifier analogue cell disruptors and homogenizers are available in 200 watt (Model S-250A) and 400 watt (Model S-450A) models. 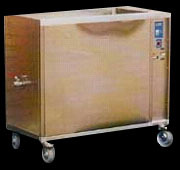 These capable units are widely-used in laboratories to facilitate a wide range of biological and chemical processes. The Sonifier S-250D 200 watt and S-450D 400 watt units offer all of the capability of the analogue models, plus digital control for precise process control and parameter meaurement. They are particularly suitable for larger or more difficult samples. The Sonifier S-150D 100 watt digital unit is a full-featured, lower power unit designed to effectively process the smaller samples often associated with genome and other biological research. Please note that the ½" disruptor horn has greater intensity and is for volumes from 10 to 250mL. The ¾" dia horn is for volumes between 20 and 500mL. 101-147-038 DISRUPTOR HORN 1/2" dia, stepped solid, threaded body. 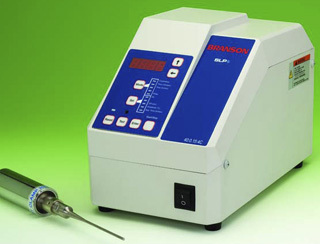 The BRANSON Sonifier SLP Series units - available in both time and energy (joules) models - are capable of processing today's laboratory requirements. Software prevents inappropriate data entry and sounds an alarm if the process moves outside set limits. The SLP Series units include the generator/power supply, converter, 1/8˝ microtip, all interconnects, and an I/O port for external control. They operate at 40 kHz, 50/60 Hz. SLPt (time), 150W and SLPe (energy), 150W - ask for more information.